We’d love your help. Let us know what’s wrong with this preview of The Sameness in a Consistent Change by Sujay Malik. The wheel of time is a fascinating force. Sometimes it seems to only crawl along, while at other times it simply hustles. And when you tend to look behind, you expect that most puzzles would fall in place. But do they eventually? Ramanuj, a village boy is confused about most things. He shares a strange rapport with his father, who, despite financial issues doesn’t stall hi The wheel of time is a fascinating force. Sometimes it seems to only crawl along, while at other times it simply hustles. And when you tend to look behind, you expect that most puzzles would fall in place. But do they eventually? Ramanuj, a village boy is confused about most things. He shares a strange rapport with his father, who, despite financial issues doesn’t stall his education. But Ramanuj has no idea what to do with himself. Then one day things change and change permanently. There is no looking back from this bend; there cannot be. He meets Mr. Shrirangpure, through a chance meeting in a hospital through his daughter Pallavi. Something prompts him to appear more ambitious than he would like to have been. Impoverished and submissive, he manages to rise above the shackles with time, even though everything is still stuck to his past. But now he cannot get back. He doesn’t want to. Until a revelation, prompts him to go back to his roots again. To the same tree, with which he shares a bond; to the drain water, with which he has shared many a memory; and to the same surrounding, which formed his core once. This is a story of a boy who tried to end his life once. He loved as well and tried to rise to a level to become worthy of it. A boy, whose journey is all about mostly looking back. To ask other readers questions about The Sameness in a Consistent Change, please sign up. The Sameness In A Consistent Change by Sujay Malik is a story of Ramanuj, a boy from a small village. How Ramanuj's life changes after he meets Mr Shrirangpure. The plot of the story is interesting with some twists. The narration of the story is good but could have been much better. It's a story of 42 pages. I wish the author could have been some more details. one can relate to the story from the very first page. I liked the way the author sequenced every event. The plot switches between the past The Sameness In A Consistent Change by Sujay Malik is a story of Ramanuj, a boy from a small village. How Ramanuj's life changes after he meets Mr Shrirangpure. I liked the way the author sequenced every event. The plot switches between the past and present which sometimes made it a bit tedious read. The pace of the story is good. The flow of the story is smooth. I liked the message that the author conveyed at the end. The language used by the author is simple and easy. The writing style of the author is crisp. I liked the cover and the title of the book. The blurb is too long. The author added various themes like loss, frustration, anger to made the story more interesting. This is a short story about guilt and repentance. Loved the way how engaging the characters are. Curiosity well maintained and the plot well planned. Life in all its sadness and chances of how things can turn out to be well portrayed. Nothing can change what's have been done no matter how much we try to resurrect them to unburden the mistakes of our past. *Not happy with the theme of suicide. The book starts when Ramanuj goes back to his hometown. We learn about his journey and the profound effect a man named Mr. Shrirangpure and his daughter made on his life. He visits a lot of places and recalls many memories. The book goes back and forth between the present and Ramanuj's younger days. The book is short and well-structured. The narration is continuous and flows very well. This book is a simple read that makes you reflect on a lot of things. I did enjoy this book but it failed to le The book starts when Ramanuj goes back to his hometown. We learn about his journey and the profound effect a man named Mr. Shrirangpure and his daughter made on his life. He visits a lot of places and recalls many memories. The book goes back and forth between the present and Ramanuj's younger days. The book is of 42 pages and can be finished in one go. The story is not so alluring. It made me flip off the pages too quickly as there is nothing fascinating and nothing to highlight about. The story revolves around on one character mainly Ramanuj and ends with his demise. The narration is ok. The story mostly talks about life's struggle and there are lots of philosophical aspects we can find through the author's work. But somehow the narration could have been better. The book leaves us with some critical questions like- what's the real meaning of life, what's the purpose of life etc. The storyline could have been better. But I loved the way the author ended the story with message. I enjoyed reading this one. I completed it in just one go. But I loved reading it out. Sometimes philosophical it is. Love the way it's written. The message is also beautiful. "The Sameness in a Consistent Change" by Sujay Malik is a socio ethical journey of a pessimistic young man named Ramanuj whose life takes sudden turns after meeting a gentleman named Mr. Shrirangpure through his love interest Pallavi. Ramanuj's entire focus in life is portrayed to be highly deontological; where every moment of his committed actions matters a lot to his inner self but he is least bothered about the end results. Rightly said by author too, "A journey, devoid of a destination, perhaps. But the fun, sometimes, lies only in the journey." Cannot reveal more than this about the plot as that will destroy the thrill of reading the book. Overall it is a very good attempt by the author, especially keeping in mind today's self publishing spree. Choice of words are very apt and so are the characterizations. In some places the storyline was about to go slow but right there author picked up gears to retain the interest of readers. Literoma rates the book as 4*/5* and recommends it for senior readers.
" The Sameness in a Consistent Change " by Sujay Malik is the story of a village boy "Ramanuj", the one who is confused about life. It talks about the struggles or I would say his confusions towards his life. With a great message and emotional touch, the story of the book is short and simple. With a very few characters and scenes , the whole story is a flashback of an old man. The title "The Sameness in a Consistent Change " is simple and catchy. On the other hand the cover page of the book is not " The Sameness in a Consistent Change " by Sujay Malik is the story of a village boy "Ramanuj", the one who is confused about life. It talks about the struggles or I would say his confusions towards his life. With a great message and emotional touch, the story of the book is short and simple. On the other hand the cover page of the book is not so eye catching and also it looks so simple. Language of the book is lucid , simple and easy to understand. Characterization of the story built so well. One and all , I would say its not a philosophical read but it will surely Change your view towards life ! I thoroughly enjoyed reading this book.I would personally recommend this book to all the book lovers and specially to those who love short stories . 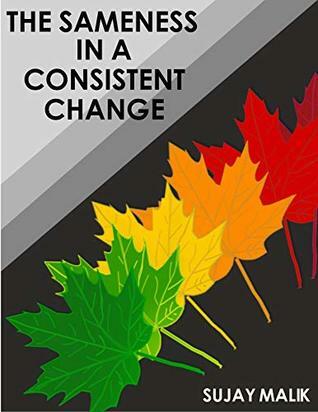 The Sameness in a Consistent Change is a book by Sujay Malik. I had read the earlier book of the author which was a collection of short stories. The number of pages, the name of the book gives a general impression that this too is a collection of short stories. But actually it is a single story. This is the story of a young chap Ramanuj who sees his father die for want of resources. At the same time Pallavi, the daughter of a politician's secretary, gets proper treatment at the cost of Ramanuj's The Sameness in a Consistent Change is a book by Sujay Malik. I had read the earlier book of the author which was a collection of short stories. The number of pages, the name of the book gives a general impression that this too is a collection of short stories. But actually it is a single story. This is the story of a young chap Ramanuj who sees his father die for want of resources. At the same time Pallavi, the daughter of a politician's secretary, gets proper treatment at the cost of Ramanuj's father. The story deals with their emotions, their feelings and their regrets. A tiny book that asked you big questions. The writer, without preaching or moral-policing, forces the readers to delve into their subconscious and makes them asks a lot of questions. Why are some people born the way they are? Why are some people fortunate and others aren't? Is your ambition really your ambition? Who decides your life's goals? Are you happy? What makes you happy? Are you doing that? Do you even know? My only grudge with the book is that A tiny book that asked you big questions. My only grudge with the book is that author has tried to make every line dip into a morality pool, using unnecessarily rich vocabulary even at places where simplicity would do. The Sameness in a consistent change is the story about the main protagonist "Ramanuj" , a village boy who is confused about life. The book tells all about his emotional turmoil and struggles of his life journey. The cover is very simply designed but the title is very interesting and intriguing. A good storyline with well portrayed characters . The language is easy and simple and it's a slow paced book.
" a journey devoid of a destination perhaps, but the fun , sometimes lies only in the journey " this line by the author motivates the most. It's a short and one time read for me. Narration is simple. The characters interact with each other in a natural way. I had the pleasure of reading the previous book (Different beads of the same string-A collection of short stories) of the Author and loved it. But this time Author failed to maintain the same magic. It doesn't good as I expected. it was a simple story with almost no twists and turns. The author – Sujay Malik has used few complex words out of his vocabulary, which made me feel that I might need a dictionary! But at the same time, they are blended the lines and story line which did not make me go back to the dictionary every now and then. I found the story line and characters quite average. Little more details about the characters other than Ramanuj might have made the book more interesting. Read complete review at - Amita's it was a simple story with almost no twists and turns. The author – Sujay Malik has used few complex words out of his vocabulary, which made me feel that I might need a dictionary! But at the same time, they are blended the lines and story line which did not make me go back to the dictionary every now and then. The title "the sameness in a consistent change" itself says about the story and is a perfect title for the story. Story is about a boy who was confused about his life as what to do and how to start. Story is about the struggle and have portrayed the past, present and future of ramanuj; including the curved through which he travelled his life, his struggle phase and each moment of his life. The sameness in the story is maintained irrespective of the situation the protoganist faced in his life. wri The title "the sameness in a consistent change" itself says about the story and is a perfect title for the story. The sameness in a consistent change is a story of village boy Ramanuj who is confused about his life at one point. But his life changes with the time. This is a good short story which conveys a message that, sometimes you need to enjoy journey without worrying about destination. I was expecting some twists and turns. Though, it didn't left me completely disappointed. A good story that can let you cherish some moral values, the nature of humans. It's emotional, sentimental and clearly describes the living in Indian Scenario. It was painful, motivational and casual at the same time..! The protagonist was a complete positive side, innocent. The love story was left unanswered because the hero remained single in memory of his first love..! This story basically teaches us the meaning of life. How a normal boy learns to dream, how a family compromises and sacrifices things for the betterment of others. Despite being said that, the story does has various twists, and how the actions of our past affects our present and future. Had high hopes having read 'Different Beads Of The Same String' by the same author. But, the tale was okayish though somewhat connecting to the scenarios in Malgudi Days. The termination of story, with a thought provoking message regarding life for readers. The typing errors. The book needs to be proof read. The story ain't monotonous if you could connect the dots that errors leave behind. It question's on life and leaves you pondering. The book Sameness in a consistent change describes about the struggles we go through in our life. The protagonist Ramanuj describes about the phases he had gone through in his life. The story seems to be toggling to past and present. Has a very few characters. Amazing story 👍👍. The way of delivering the past & present life is quite impressive. I was expecting more twist and turns. But it's fine, writer beautifully conveyed few messages through this story. This is the story of "Ramanuj", a small town boy whose life wasn't that pleasant and it only rendered him with more questions and confusions. The plot revolves around the past of the protagonist and how destiny changed his course of life. The language is lucid and the plot could have been enriched more to engage the readers with the book. The title suits the book and the blurb gives way more information about the content of the book. Having read the author's previous work, this book didn't match t This is the story of "Ramanuj", a small town boy whose life wasn't that pleasant and it only rendered him with more questions and confusions. The plot revolves around the past of the protagonist and how destiny changed his course of life. This is the journey of Ramanuj, a village boy, who rises above all shackles and shatters norms to move forward in life and achieve his goals. It's a journey without any destination because what matters in the end is the journey and efforts. Not the destination. The cover is really simple. It could have been a bit more enhanced. It doesn't give away the plot though, which is a good thing. The title is very intriguing, it rouses your curiosity. It also hints at what exactly the plot is. The plot is very enlightening and informative. Ramanuj's journey proves that the journey is what matters the most, not the destination or results. I loved that thought. The narration is lucid and very easy. But a few typos can be seen here and there. It's a short book that's meant to enlighten you and motivate you for your future goals. Chartered Accountancy, a degree in Law and a degree in Commerce later, Sujay discovered the little writing bug entrenched within him. And he decided that the bug shall be given an opportunity to come out of the closet. He comes from a family of legal professionals and is extremely passionate about writing. He is the winner of MyStory Contest of Tata Literature Live, The Mumbai Litfest 2017. Sujay's Chartered Accountancy, a degree in Law and a degree in Commerce later, Sujay discovered the little writing bug entrenched within him. And he decided that the bug shall be given an opportunity to come out of the closet. He comes from a family of legal professionals and is extremely passionate about writing. Sujay's discerning perception with respect to matters going around him and its resulting consequences makes him a keen observer which he likes to reflect in his writings too. Through his stories, he likes to symbolize nuances of human characteristics, social behaviour, evils, ironies and vagaries of life. He believes that stories are nothing but a reflection of the lives and times that we stay in. His interests include reading, playing table-tennis, taking long walks and listening to music. He stays in Mumbai with his wife and his parents. When he isn't doing any of these he is checking his emails. 'Different beads of the Same String' is his first book.